Each customer, every project and ALL Mallard solutions are unique. This certainly makes life interesting for our design team and calls for some creative, flexible accessories like our Floor Mounted Pallet Flow Supports to guarantee just the right customized fit for your application. 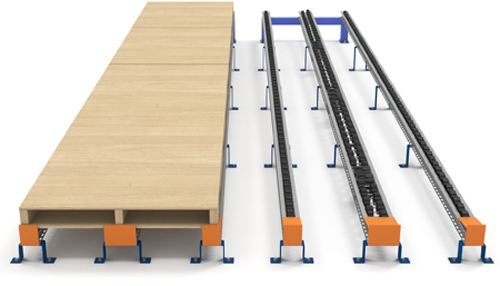 You have two options when mounting pallet flow lanes to the floor… level pallet flow that is push-assisted or gravity fed pallet flow which is mounted at a slight incline. If you are flush-mounting level lanes, they can be lag bolted to the floor, but if you are slightly elevating them then Mallard custom designed supports are the answer. Unlike many traditional systems, Mallard mounted supports are manufactured and installed to your specific height requirements. 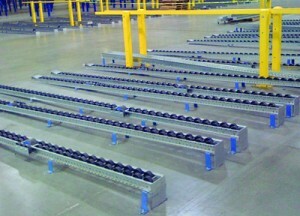 Mallard manufactures a number of floor mounted support options for all pallet flow rack types – several of our options are adjustable to accommodate product, pallet and application changes.